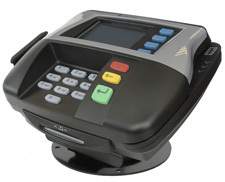 Effective January 1, 2010, tactile keypads are required at every check-out location in California with a flat screen point of sale device. The keypads must be permanently attached. Tactile Keypads are needed so that customers with visual impairments can confidentially and privately enter their PIN when using a debit or other PIN-based card. The keys are arranged like a standard telephone keypad with a raised dot on the five key to assist blind people in orienting to the device. Raised symbols and clear color contrast on function keys (such as enter and cancel) are also important. Many national retailers, including CVS, Wal-Mart, Rite Aid, RadioShack and Trader Joe’s, have participated in the Structured Negotiations process on the issue of tactile point of sale devices. These retailers have signed agreements with blind organizations including the American Council of the Blind, the California Council of the Blind, the Bay State Council of the Blind and the American Foundation for the Blind to install tactile keypads in thousands of stores across the country. Tens of thousands of keypads have already been installed as a result of these efforts. While California has a specific requirement for the number of keypads to be installed, the devices are required in every state to ensure compliance with the nondiscrimination, equal service, and effective communication provisions Americans with Disabilities Act and the laws of many other states. Read the list of agreements reached about tactile keypads. Read the press releases issued about tactile keypads. This post is about a new California law. There now needs to be keypads in all retail locations with flat screen check-out devices. Keypads let blind people enter their PIN by themselves. No one should have to share confidential information with a store clerk.